A Coca-Cola celebrou os seus 25 anos em Espanha com o maior outdoor interactivo do mundo. Formado por 15 mil garrafas da edição especial em alumínio da Cola Light, o outdoor era filmado por uma webcam, que as pessoas podiam usar para escolher uma garrafa. Haviam 25 garrafas premiadas. 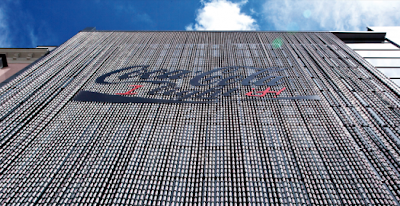 Coke celebrated it's 25 years in Spain with the world's largest interactive billboard. Made by 15 thousand bottles of Light Coke, the billboard was filmed by a webcam, which people could use to choose one of the bottles and try to find one of the 25 bottles that had prizes on them.